Hit play on the debut disc by Radkey and the first thought upon hearing the opening stanza of “Dark Black Makeup” is that singer-guitarist Dee Radke is a dead ringer for Glenn Danzig. His deep baritone and smooth delivery belie his 23 years. The Missouri-based band of brothers also includes bassist Isaiah (21) and drummer Solomon (19). The disc is an amalgam of brooding vocals set over mostly upbeat rock and punk. Radkey mixes The Misfits’ steamroller punk with the heavy hooks of Nirvana and the pop sensibilities of Weezer. Among the many highlights on “Delicious Rock Noise” are “Le Song,” a tune performed in the style of legendary Lodi horror-punks The Misfits, “Feed My Brain,” which is propelled by fluid bass and drum work, “Glore,” which features a scorching guitar solo, and “Marvel,” a cover of the song by The Lemons that serves as Radkey’s tribute to their love of comic books. On “Dark Black Makeup,” Dee Radke sings about “kids these days,” ironic given his age. 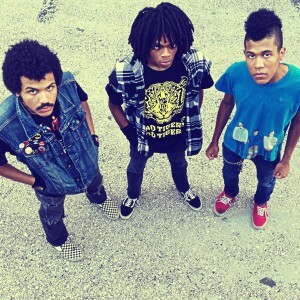 Yet maybe not, considering Radkey are a tight and very talented unit whose infectious punk rock betrays their age. The band got its start in 2011 opening for Fishbone. We recently spoke with bassist Isaiah Radke. How did you come up with the name “Delicious Rock Candy” as your album title? When I was pretty young I stuck a sticker with the saying on the back of my bass. It describes our music perfectly and we figured it was the perfect title for our first album. What hits you immediately when putting on “Delicious Rock Candy” is your brother Dee’s vocals and their uncanny resemblance to Glenn Danzig. That’s his natural voice and having a really good voice is more than half the battle of being in a band. We’re lucky that he’s got such a great voice. When did the three of you start playing? It seems like we’ve always been into music and we’ve been doing the band for six years now. We practice all the time and our goal is to become better both musically and professionally. It seems like you try to balance the harder yet catchy punk of bands like The Misfits with the alternative rock of Nirvana and the pop sensibilities of bands like Weezer. All of those groups had a huge influence on us. So did the Ramones. We want to have a lot of different sounds and be heavy without losing the catchiness. We don’t want people to forget our songs. We believe in hooks. We can do metal songs that are really hooky. It’s important to us that we never have one sound. The last thing some kids would want would be to play in a band with their brothers. We absolutely wanted to be in a band together. It started as a fun thing, just jamming, and the next thing you know it’s your job. You put out an EP in 2013. How have you grown as musicians and as a unit since then and now, with the release of your debut full-length album? When we first started off all we knew how to write was fast jams. Now from working with our producer (Ross Orton, who has produced Arctic Monkeys), he kind of showed us what we were capable of, and we could be the band we always wanted to be, with big punk rock choruses. You’ve said you never thought your music would take you to the places it has so far. It’s been a whirlwind. Being a home-schooled kid from Missouri never having left the state and creating something that you get to the see the world with feels really good. Our only ambitions have ever really been to make a record that people will love and to be able to play as many shows as we can. We’ve been living this for years now. This is literally all that we do and this record is evidence of that. I stop and think, ‘man, I’m 21-years-old and I’ve been doing this since I was basically 14.’ We’re still making the same kind of music we were when we started, but we’re better at it now. We’ve been able to go out into the world and experience some real things, which give us more to write about. We just want people to listen to the album. And play it really loud.